RV Camping!…what a great way to leave your worries behind and enjoy the great outdoors. The clickable map is your key to finding the best campsites and locations. Each state page has a unique set of RV camping information sources, RV parks, free camping locations, maps, and research tools to help you find the best RV campsites. Arizona offers many great Spring RV camping opportunities. We’ve got tips and information about public lands to help you find the best camping locations in every state. Learn about free camping, the rules, and regulations of public lands, official contacts, campgrounds, maps, and boondocking on lands managed by the USDA Forest Service, Bureau of Land Management, National Park Service and more. State Wildlife Management Areas are another source of RV camping locations, and we’ve got links to just about all of them. You will find information and links to state, county, and community parks that offer great camping opportunities. Spring camping season is here and the warmer weather finds folks heading for their favorite RV camping locations. Many folks have de-winterized their RVs, while others are planning Spring and Summer trips or getting ready for their first RVing adventure of the year, while still others have already headed for their favorite RV camping destinations. 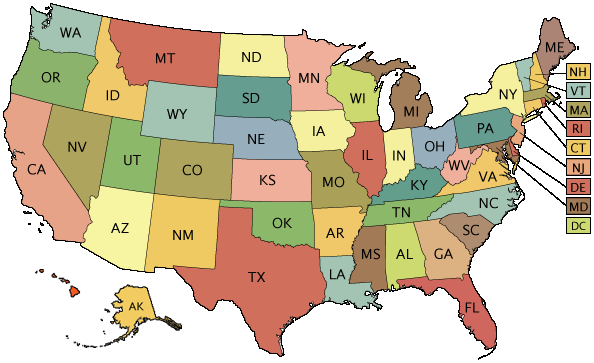 No matter where and when you like to go RV camping, you can find information about the best RV camping locations nationwide by clicking a state on the above USA map. Click on the following links for information about camping and recreation on your Public Lands. We’re building an extensive Maps Section of RV camping Locations state by state. We show you on Topographical Maps where free RV camping sites can be found as well as fee public campgrounds. You will also find links to official public land web sites for more information about RV camping regulations, access, and availability. Our free RV Camping Check Lists will insure you don’t forget a thing on your next outing. Copy the list, then edit it for your specific camping needs. You should have just about everything you could possibly need in your RV for a safe, comfortable, and trouble free camping trip. Private RV Parks And Campgrounds has online resources and commercial RV camping club and RV membership association information. One of the best places to help you locate RV parks in every state. Discount and Bargain RV Camping Clubs offer discounted rates, travelers services, and even RV Insurance. If your RV camping lifestyle includes staying in RV parks frequently, these discount clubs can substantially reduce your nightly camping costs. RV Camping Clubs are great for any RVer. There are vehicle type and family oriented groups, as well as lifestyle and geographical location RV clubs. RV clubs offer opportunities to make new friends and meet people that enjoy RV camping. Articles about RV camping topics, such as where you can camp, winter camping safety, finding dispersed campsites, and more. 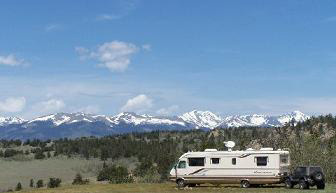 Our latest article is Yellowstone RV Camping. Information about campground reservations, first come first come campgrounds, descriptions, photos and more. capable of supplying all the power you could need for extended camping trips. RV Books, videos, and more! Campsite-Search is our old blog (weblog) of raves, rants, and ideas about camping, full time RV living, and our search for the perfect RV campsite. FAQ’s answer our most common questions about RV camping and using our web site. RV Camping Travelog takes you with us as we travel North America. Come along with us as we visit great public lands RV camping locations and destinations. Featured RV Camping Locations shows you our reviewed and recommended RV camping locations. Includes campsite location maps, photographs, directions, and activities available.